Codeine is habit-forming (addictive). Mental and physical dependence can occur but are unlikely when used for short-term pain relief. Using codeine during pregnancy can cause opioid withdrawal syndrome in the newborn, which may be life-threatening if not treated. Codeine is a narcotic pain-reliever and cough suppressant similar to morphine and hydrocodone. Moreover, a small amount of codeine is converted to morphine in the body. The precise mechanism of action of codeine is not known; however, like morphine, codeine binds to receptors in the brain (opioid receptors) that are important for transmitting the sensation of pain throughout the body and brain. Codeine increases tolerance to pain, decreasing discomfort, but the pain still is apparent to the patient. In addition to reducing pain, codeine also causes sedation drowsiness and depresses breathing. Codeine is the generic name or the name of the actual drug component inside the medication. There are many different brand names of codeine, depending on which company has manufactured the drug. Codeine is a type of drug called an opioid. This is a drug class that helps us to group drugs that work in a similar way together. Codeine is usually in the relief of mild to moderate pain. For more severe pain, it is best to use a different type of opioid drug instead because side effects are less likely to occur. 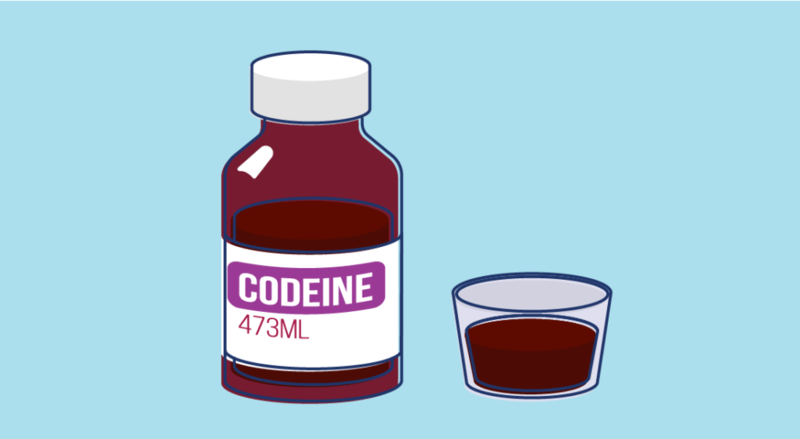 Codeine can also sometimes be used to suppress a dry cough or to relieve short-term diarrhea. It is important that it is only used on a short-term basis for these indications and not as a continuous treatment. Codeine use often starts out innocently enough with a prescription for a codeine-based cough syrup. Because codeine is less regulated than some opiates considered to be more dangerous (such as morphine and OxyContin), getting and abusing it is relatively easy. Though less potent, codeine provides effects similar to morphine. As an opiate, codeine runs a high risk of its users developing a tolerance and eventually a dependence on it. Although many people begin using codeine to relieve a legitimate condition, it is frequently abused as tolerance develops. Many codeine users begin to turn to the drug to cope with all of their physical pain and eventually their emotional pain as well. If you or someone you care about is struggling with a codeine problem, get help now. Codeine is a “prodrug” of morphine. This means that some of the codeine doses is converted to morphine – another opioid drug – inside your body. For example, if you take a 30 mg dose of codeine you would produce approximately 4.5 mg of morphine from the dose in your liver. The exact amount of amount of morphine produced changes from each person according to your genetic makeup. There is a certain enzyme in the liver that is involved in converting codeine to morphine – called CYP2D6 – and everyone has a different amount of this enzyme.